Paraphrasing Plato…It’s not so much the object, but rather the emotion one attaches to the object. And that’s exactly what you did so masterfully in designing and building our Santa Monica home. You brought to live our vision of transforming a circa 1939 English cottage into a sophisticated and contemporary Japanese inspired craftsman. Our appreciation of your talent is validated often by folks passing on foot and by car, stopping to admire both your architectural and landscaping prowess. Comments such as – Your home is just beautiful… Your home is awesome… Your home makes me feel good every time I see it… I love your home – have become common occurrence. What people don’t see from the street is your design penchant for light, space, volume and flow. Not until someone has lived in a home over a period of months can they fairly appraise balance between form and function. Now in our new environment for six months, we can honestly say that balance is centric to the architecture. Even without using a Feng Shui consultant, the house flows effortlessly from old to new and back again with Zen sensibilities. When you love something as much as we do our home, you want it to last a lifetime. And quality craftsmanship is abundant here, evidenced by everything form foundation and framing to fit and finish of exterior stucco to solid cherry wood kitchen cabinets and granite counters. As everyone knows, the construction process is never without stumbling blocks and frustrations. Of importance to us, was you attentiveness to construction timelines and ability to marshal subcontractor resources. 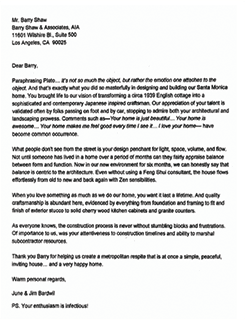 Thank you, Barry for helping us create a metropolitan respite that is at once a simple, peaceful, inviting house…and a very happy home. P.S. Your enthusiasm is infectious!